It’s a chilly November evening, but inside Apiary Studios in East London, things are heating up as the venue gradually fills with people. The atmosphere is electric; everyone is here for the Cyberdelics Incubator, an event aimed at showcasing the latest in psychedelic arts projects using immersive media and techno-wizardry. 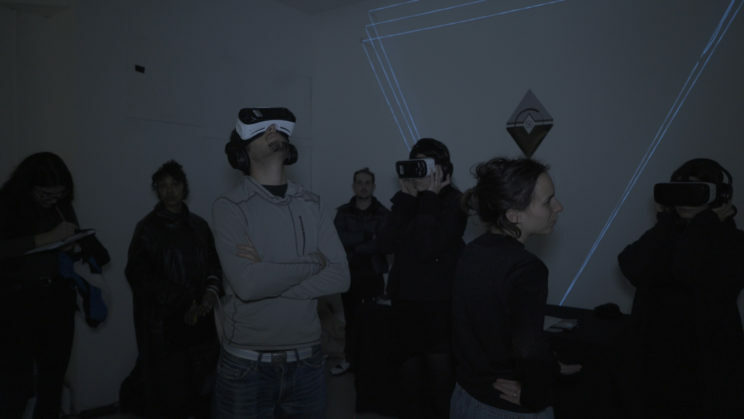 Through the course of the evening, eight speakers will showcase their projects, which are united by the use of immersive media as a tool for transforming conscious experience. 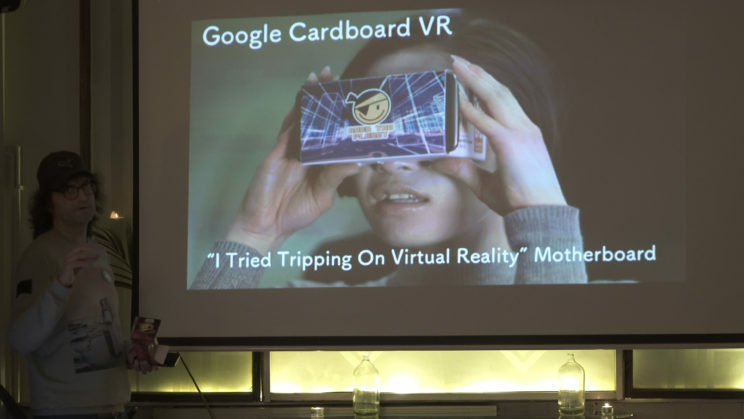 Following a tightly packed schedule, the speakers discuss psychedelic virtual reality (VR) experiences, augmented reality paintings, sound-to-light digital artworks, and more. 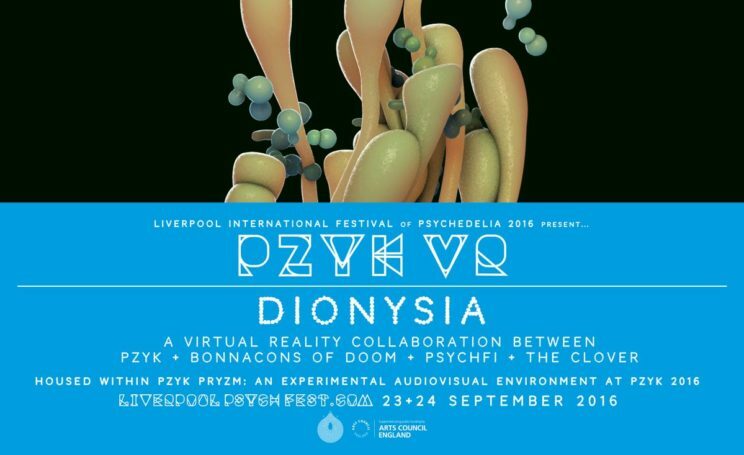 For instance, the PsychFi collective situates VR booths at events such as the Liverpool International Festival of Psychedelia, eliciting hallucinatory experiences through digital media. Their Dionysia experience considers VR as analogous to an LSD trip; the user turns on, boots up, and jacks into a trippy alien world. Another project by Virtual Awakening called Death is only the Beginning takes a more radical approach, as the creators aim to simulate a near-death experience. Drawing upon Rick Strassman’s studies, which argued that reported experiences of tunnels of light were caused by endogenous DMT (dimethyltryptamine, a powerful hallucinogen), Death is only the Beginning aims to simulate a death-trip in order to make the user re-evaluate their life in positive ways. If this sounds a bit heavy, later on in the evening we also hear about choreographed drone-dances and Kerouac-style road-trips across America depicted in VR. What unites these various projects is the idea of using the latest immersive technologies as tools for altering consciousness. This idea is not entirely new; the ‘expanded cinema’ movement of the 1960s and 1970s explored a similar idea using analogue audio-visual equipment. Indeed, the term ‘cyberdelic’, a portmanteau of cybernetics and psychedelics, was popularized in the techno-hippie cyberculture of the 1990s, as figures such as Timothy Leary claimed that computers would be to the nineties what LSD was to the sixties. Douglas Rushkoff’s classic book Cyberia (1994) explored this area, documenting the activities of the self-proclaimed ‘technoshamans’ such as RU Sirius, founder of Mondo 2000, the cyberpunk magazine par excellence in which one could find frenetic writings on everything from smart drugs, house music, and digital sampling; to VR, hyperlinks, and cybersex. Lately, this whole area has been seeing something of a revival. Immersive arts seem to have come-of-age, as new holographic mixed-reality technologies tease at the possibility of bringing the futuristic worlds of science-fiction to life. The Cyberdelics Incubator is just the tip of the iceberg. In the past year, we have seen a growth in fulldome, a form of 360-degree cinema that is increasingly popping up at digital arts festivals. 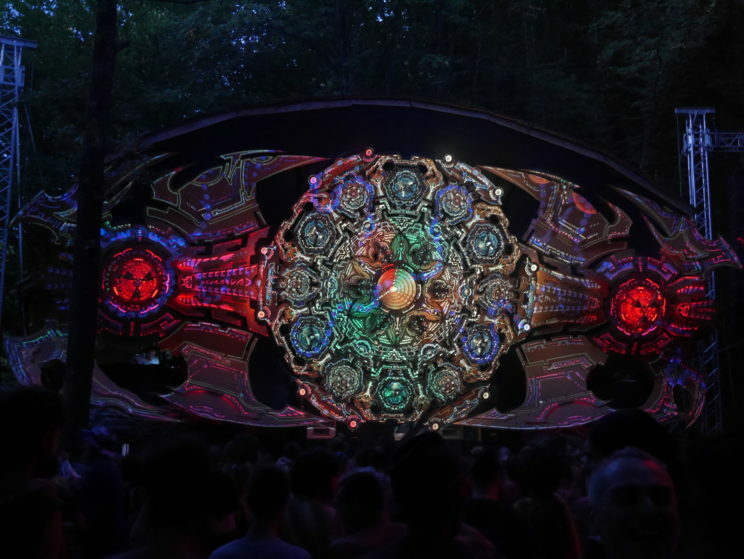 As showcased at FullDomeUK, fulldome productions such as Android Jones’ Samskara are explicitly psychedelic, taking the audience on hallucinatory voyages through immersive video. 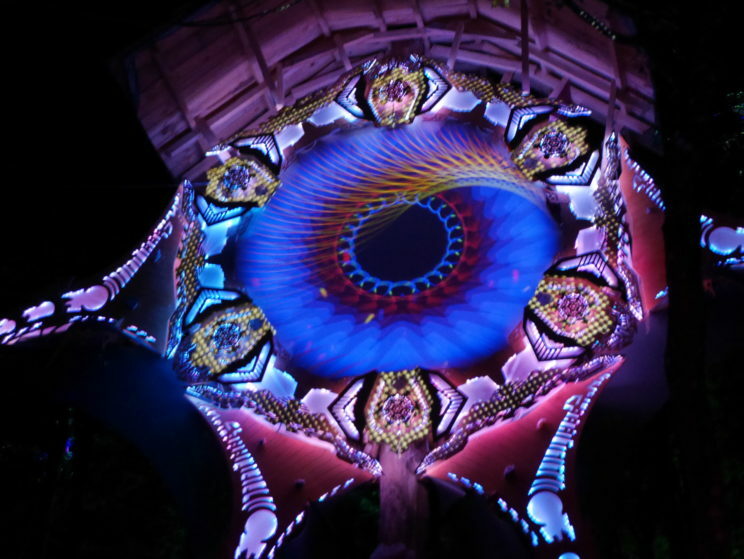 Elsewhere, video mapping has been transforming music festivals into synesthetic wonderlands. 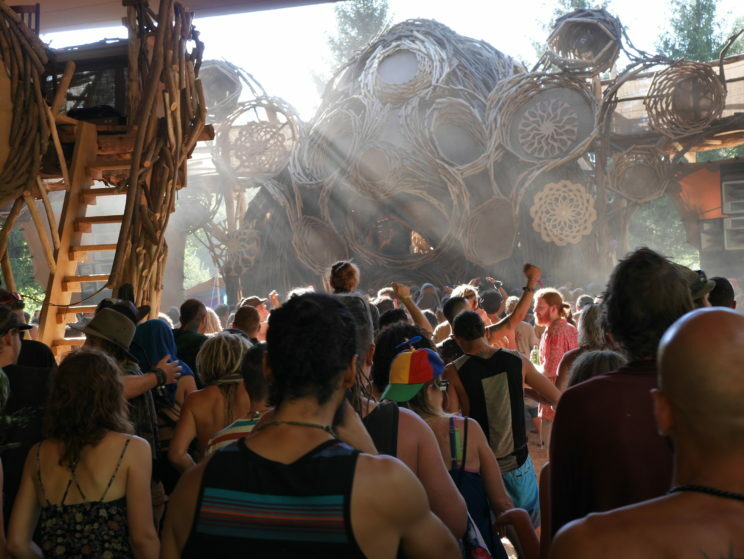 Over the summer I visited Mo:Dem in Croatia, a psytrance festival which delivers rolling waves of hypnotic electronic dance music to swathes of bronzed hippies. 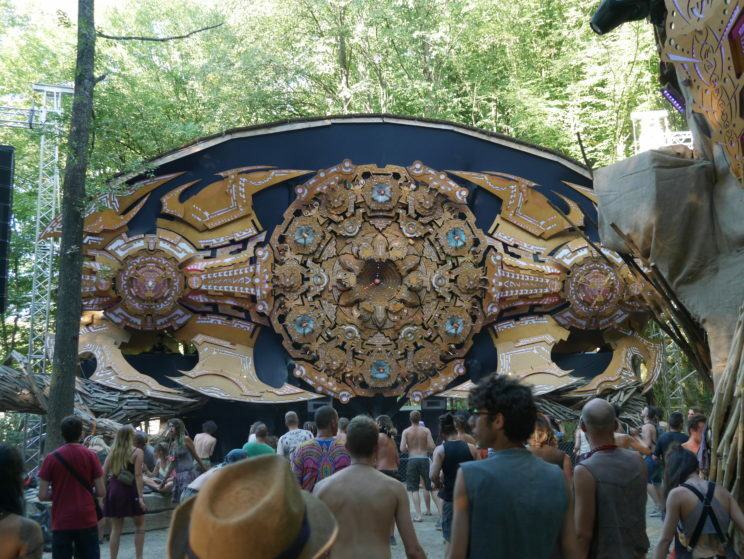 What stands out at Mo:Dem is not so much the music, but the huge, intricate video-mapped sculpture that looms above the dance floor like a crash-landed UFO. 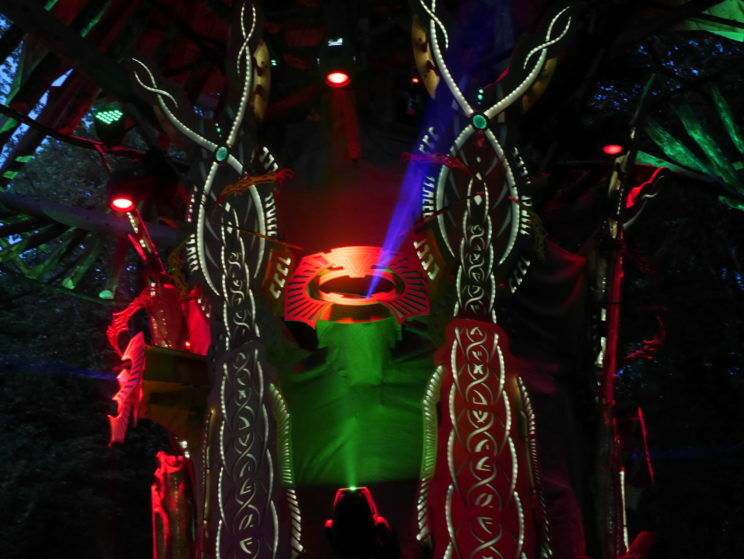 As day fades into night, this sculpture comes alive with pulsing neon lights and shamanic Amazonian patterns, becoming a shrine to the alien gods of psytrance. So can you really get high on technology? The answer is yes, but not in exactly the same way that drugs or alcohol get you high. So can you really get high on technology? The answer is yes, but not in exactly the same way that drugs or alcohol get you high. These are media-induced states of consciousness. Sound and music produce powerful emotional responses that set the pulse racing, while visual images that construct hallucinatory worlds that frame these with meaning. But hold on — couldn’t we argue that watching the latest Hollywood blockbuster does the same thing? What then, if anything, makes these ‘cyberdelic’ experiences unique? I shall venture a few things. 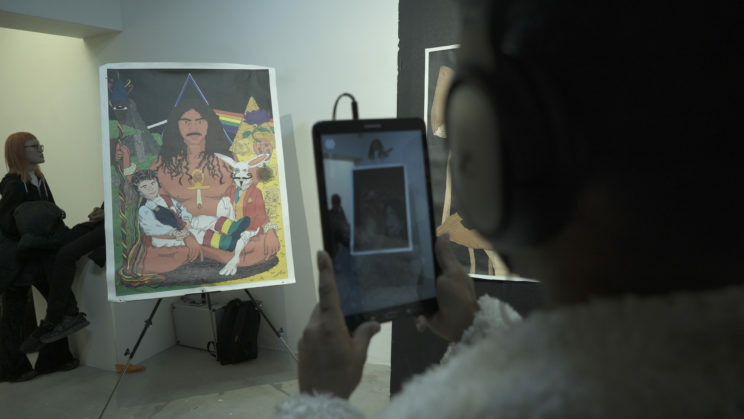 First, the artists are seeking to emulate the form of hallucinatory experiences, and in doing so they offer explorations that might draw the nature of human consciousness into focus. Second, by placing an emphasis on how media can affect us in potentially powerful ways, they might also cause us to re-evaluate the wider digital media-scape we exist within, and understand how this is affecting us. In a world where the emotional ‘hits’ we get from social media are increasingly monetized based on intelligent algorithms, such re-evaluations might be just what the doctor ordered. Not everything at the Cyberdelics Incubator hits the mark; some of the projects take a more ‘spiritual’ approach and make bold claims regarding the healing properties of their work that lack scientific support. 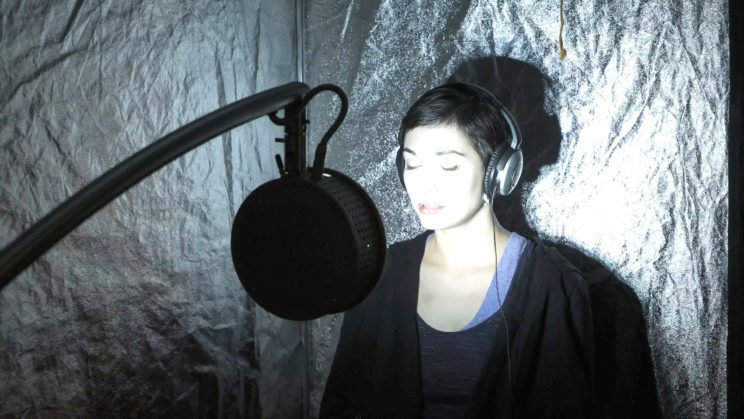 Yet taken as a whole, these artists might be on to something. If the 1990s saw an optimism towards computers, the decades since have seen this fade as the darker side of internet technologies has reared its ugly head. A bit of idealism about how we can use media technologies in positive ways might not be such a bad thing — at the very least, if you get the chance to try out one of these immersive experiences, it will probably be worth ten minutes of your time to find out for yourself. Cyberdelics Incubator, London, 1st November 2017. Photo credit: Laurence Chater. Cyberdelics Incubator, London, 1st November 2017. Photo credit: PsychFi. Mo:Dem festival, Croatia, 28th July 2017. Photo credit: Jonathan Weinel. Featured image: “Mo:Dem festival, Croatia, 28th July 2017” by Jonathan Weinel. Image used with permission. Jonathan Weinel is an artist, writer and Visiting Research Fellow at Aalborg University, Denmark. 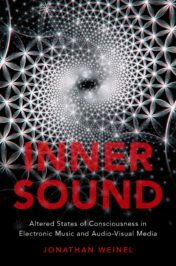 He is the author of Inner Sound: Altered States of Consciousness in Electronic Music and Audio-Visual Media.